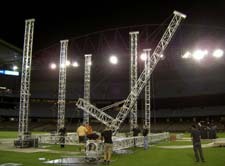 CLS provided lighting and a ground support system for a 7.9 Tonne LED screen at Telstra Dome in Melbourne for the Commonwealth Games workforce event called TEAM 2006 Unite on Saturday 10th of December 2005. 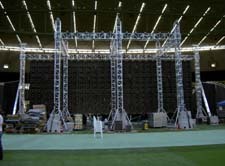 Eight CLS ground support towers and 13.5 Tonnes of concrete and lead ballast were put in place for the big lift. Lighting designer Tim Newman used two Robert Juliet Cyrano 2.5KW followspots and four Griven 4KW Colour Jets with wireless dmx control from the top of the scoreboards to add extra punch to the stage lighting.